Matching Dragoons: Jonah Hex #58 "The Treasure of Catfish Pond"
Jonah Hex #58 "The Treasure of Catfish Pond"
"The Treasure of Catfish Pond"
Jonah is riding along, minding his own business, when he hears a a ruckus over the hill. Investigating, he discovers an old man tied to a tree and being tortured by several other men with a branding iron. Jonah comes riding down like the devil himself and starts sending several of the men to their just rewards. Jonah cuts the man down from the tree and just as the man dies he says"....cat....fish....". Jonah then packs up all of the bodies and heads into a nearby town. 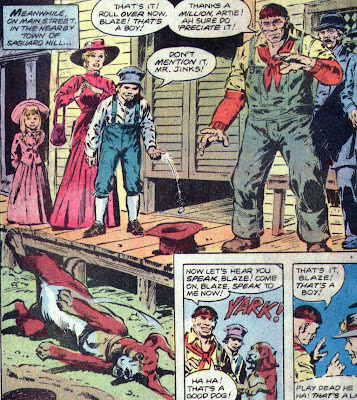 In town we meet Mr. Jinks, a simple man, and his trick dog, Blaze. When I say simple, I don't mean that he is uncomplicated, he is slow and he makes money by putting on shows with his dog tricks. Just then a man comes running up, telling Jinks that he heard that Duncan Bradley is dead. Bradley is the old man that Jonah tried to save and he and Jinks were best friends. Jonah is speaking with the sheriff and they are discussing why Bradley was being tortured. Mr. Barrett, the banker says that it must have been the $50,000 ($933,767 today) that Bradley stole from the bank. The Sheriff claims that there is no proof yet who stole that money and since an argument has started, Jonah heads for the saloon and some grub. Bartlett shouts that there is a $5,000 reward for the return of the money. Jonah is stopped by Jinks who asks if Bradley is really dead. When Jonah tells him that it is true, Jinks starts crying that he has lost his best friend. Jonah starts to ask Jinks about the word "catfish" but there is a sudden cry from down the street. A wheel has started falling off of a loaded buckboard. Jinks runs down the street and grabs the corner of the buckboard, and despite it being loaded with mining supplies, Jinks holds the wagon up while the wheel is reattached. But, crisis is a byword in DC comics. There is suddenly a runaway horse and wagon coming down the street and old slow Blaze is standing in the middle of the road. Jinks can't save him without dropping the wagon on the man repairing the wheel. Therefore, it's up to Jonah to risk his skin for a canine. Jonah dives into the road and narrowly avoids being trampled by the horse and wagon. Jinks is thankful and takes Jonah back home to the boarding house where he lives. Jonah asks Jinks about "catfish" and Jinks says that Catfish Pond is where he and Bradley went fishing and there was even an old mine where they would wait out thunderstorms. Jonah decides to head up there and look around. Back at the boarding house, Jinks is looking for Blaze. The two thugs show up and tell Jinks that they saw Hex grab the dog and ride outta town, who wouldn't want a trick dog as valuable as Blaze. 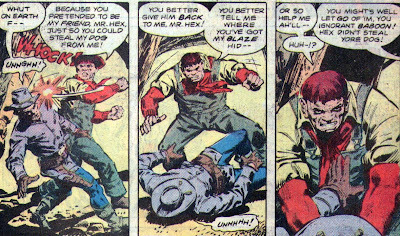 With some more cajoling, the thugs have Jinks seeing red and swearing that he's gonna tear Jonah Hex in two. Jinks heads out to the mine by Catfish Pond and the thugs are following not far behind. At the mine, Jonah has located the stolen $50k when Jinks suddenly bursts into the mine, demanding to know where Blaze is. Their fight is interrupted by Barrett and his two thugs who are going to kill Hex & Jinks and take the money. Barrett explains than Duncan was a bookkeeper and that they were supposed to split the money Duncan was embezzling but Duncan got greedy and took it all. Jinks suddenly realizes that Barrett has killed his best friend and stolen his dog. Jinks lunges at Barrett and knocks over several timbers, bringing the entire mine down on all of them. When the smoke clears, Jonah & Jinks are trapped inside the mine. Jonah locates an air shaft and Jinks gives him a boost to crawl out. Meanwhile, Barrett has manages to crawl out of the mine and has gotten on his horse and started his escape. Jonah jumps on his horse and ends up roping Barrett and bringing him to justice. Later, Jinks is reunited with Blaze and he and Jonah split the $5,000 reward. Not only was Barrett in jail, he is out the $5,000 that he put up as reward. Fleisher, your middle name must be Irony. Timeline - Another story that had nothing indicating when it took place. I'm starting to think that Fleisher had a bunch of pre-wedding stories left around and DC used those whil he was plotting all the twists and turns that would show up over the next several years. A fair story, not a great one. Next Issue - Jonah encounters the White Lotus and... the Death of Mei Ling!!! Wait...Jonah had an entire mine collapse upon him, and he wasn't hurt? That's darned amazing. 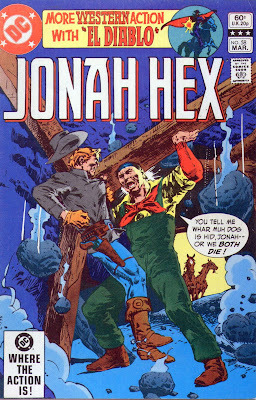 The ridiculous amounts of money that were thrown around in Jonah Hex books is also amazing. I was in a time crunch and couldn't scan the frame. It plays like this: The mine starts collapsing, Jinks & Jonah head back into the mine, Barrett heads for the door, two thugs head for their eternal sleep.